Whitney Houston has left everything in her will to her daughter, Bobbi Kristina Brown, and we hope that she can handle the wealth safely. With Bobbi Kristina’s personal and family history of drug abuse, leaving her all that wealth puts her at risk. The legendary singer – who was found lifeless in a bathtub in her Beverly Hilton Hotel suite on February 11 – has willed her entire estate, including all of her money, cars, furniture and other personal effects, to her 19-year-old daughter. According to a 19-page court document obtained by Inside Edition, the will was first set up in 1993, but later amended in 2000 – when she was still married to Bobby Brown – and while the singer is mentioned in the will, he will receive nothing. Bobby was often criticized for being responsible for Whitney’s drug abuse problem but in fact, as we reported here at Celeb Dirty Laundry, Whitney was hooked on drugs before she met Bobby. 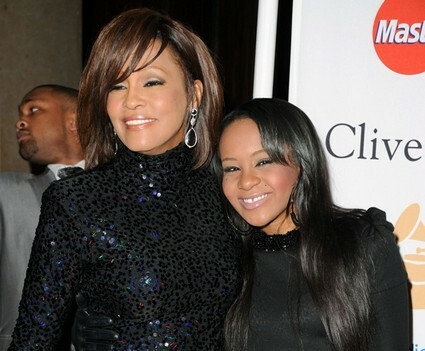 The money will be placed in a trust until Bobbi Kristina turns 21 in 2014, when she will receive a chunk of her inheritance. A further portion will then be obtained on her 25th birthday, with the final segment delivered when she hits the age of 30. Whitney’s mother, Cissy Houston, is executor of the will, while her brother and sister-in-law are named as trustees. Whitney never forgave her mother for busting up her lesbian relationship with her favorite galpal. Whitney – whose marriage to Bobby Brown came to an end in 2006 after a turbulent 14 years, which saw the relationship marred by a battery charge – signed a prenuptial agreement in 1992, banning her then-spouse from accessing her will. It stated: ”Houston shall have the right to dispose of her Separate Property by Last Will and Testament in such manner as she may, in her own uncontrolled discretion deem proper. So Whitney left her daughter Bobbi Kristina a wealthy woman. And how does Bobbi repay her, by going on Oprah and talking about her. As we reported here on Celeb Dirty Laundry, Whitney hated Oprah.